Typically, a bar mitzvah is when a young Jewish boy puts on tefillin for the first time. Family and friends gather for a celebratory reception in honor of his thirteenth birthday. The festivities culminate on Shabbat, when the young man is called up to the Torah for the first time. Phnom Penh, Cambodia, is certainly not home to your average Jewish community. But this summer, we were privy to just such a chain of events. The guest of honor, however, was no fresh-faced adolescent. Instead, meet Michael—an idealistic middle-aged American gentleman. Michael has lived in the Far East for a number of years, and is currently based in Japan, where he The guest of honor was no fresh-faced adolescentworks for the U.S. Army, training soldiers in karate and other forms of self-defense. He is also involved in a variety of humanitarian causes, including arranging the adoption of Cambodian children from impoverished homes. Although adoption still hasn’t been legalized in Cambodia, it is slated to become legal in several months’ time. Meanwhile, Michael coordinates with the local orphanages, determining which children will be adopted, and taking care of the mountains of paperwork that will need to be filled out. In terms of Judaism, Michael he has been in touch with the chaplain at the army base in Japan, but sadly there hasn’t been much Jewish programming available to him. 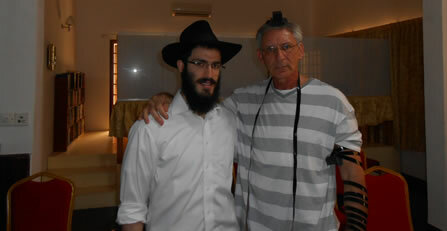 One Thursday evening, Michael called us at the Chabad center in Cambodia. He sounded very interested in the services we had to offer, and we were thrilled to hear from him, especially since nine people had already committed to coming to our Shabbat morning minyan (prayer quorum). We asked him if we he would be able to join us as number ten. “With pleasure, rabbis,” Michael agreed, to our great delight. Friday morning, the Chabad center doorbell rang at 9:15 a.m., and in strolled Michael. Oops, clearly there’d been a miscommunication. “Michael, we are so sorry for the misunderstanding! We thought we asked you to come tomorrow, on We are so sorry for the misunderstanding!Shabbat,” we said. Fortunately, Michael didn’t seem fazed in the least. “Yes, perfect. But Michael, now that you’re already here, perhaps you would like to put on tefillin?” we asked. So, we helped Michael put on the tefillin and say the prayer. We could tell he was deeply moved. That night, Shabbat evening, Michael joined us for services and Shabbat dinner, where the 30 or so participants toasted l’chaim and wished him mazal tov. Joyous singing and dancing followed well into the night. As promised, the next morning at precisely 9:45 a.m., Michael arrived at the Chabad center just in time to complete our Shabbat morning minyan. He had the opportunity to be called up to the Torah, after which all present once again broke out in spontaneous song. Michael was so inspired by his bar mitzvah weekend that he came to see us three times during the following week, before returning to Japan on Wednesday.